Achariya.net: I stalked your profile and found Everwinter, Ellantha! I stalked your profile and found Everwinter, Ellantha! We keep missing each other in Second Life. I'll log in, say hello, and then get a message hours later that says something poetic like, "I was outside playing in the rain!" Anyway, since it's been a while, I curiously poked through your public profile. I saw that your Second Life store's physical space is no longer active (aw), but that you are still selling via Marketplace (yay). I also saw that you had a sim pinned to your picks -- for the sim Everwinter (SLURL). So I went, because you are always discerning about what to wear in Second Life, and what to do when you're not shopping or creating. 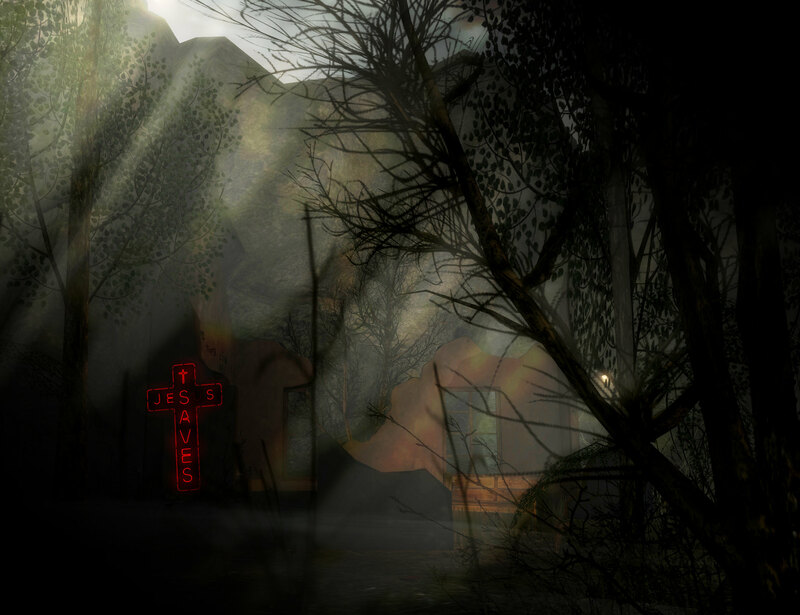 I hopped over to the sim and thought, ahh, a grimdark amusement park based upon real life, yeah, it's beautiful and morbid. I guess Second Life is like that, eh? It's a weird space that lets people remain fixed in time, if they want to be. It lets people move on if they want to move on, too. Like, mom jeans, for example. The European stores like Milk Motion were making mom jeans three years ago, and the US shops are finally catching up. And so I'm catching up to you a year after this sim's been out. I'm sure everyone knows the story. 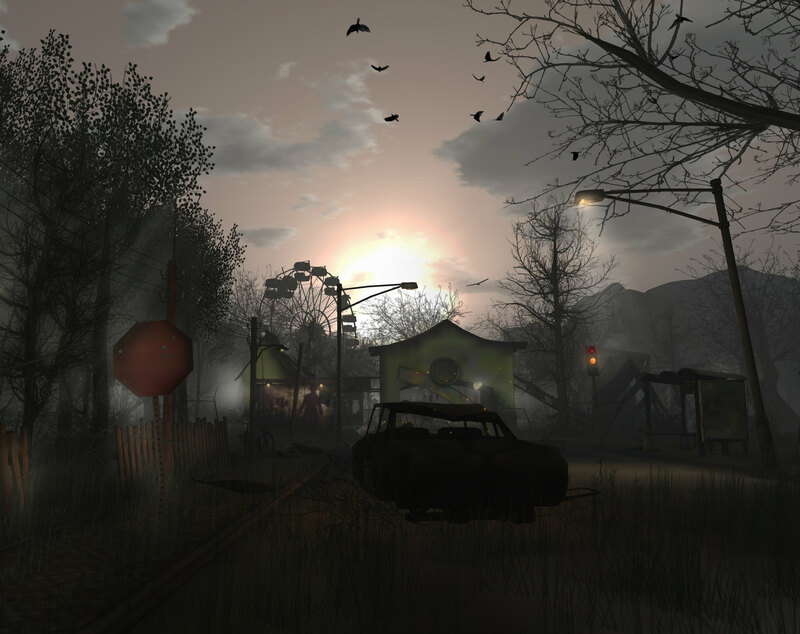 The sim is based on the Pripyat amusement park in the Ukraine, one that never got to open because four days before opening day, the nuclear reactor at Chernobyl blew. 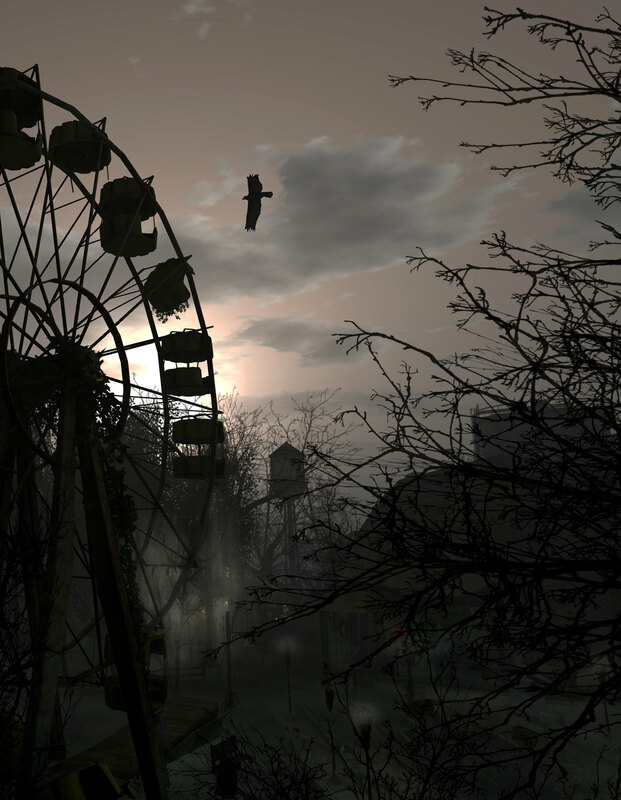 The sim is a historic, realistic justification for rebreathers and lifeless ferris wheels, and a fascinating exploration into the melancholia of decay. I've been there, recently. Haunted by the passage of time, even when my avatar's inventory is like a romp backward through memories of Second Life past. So this was an excellent reminder that technology persists. The thread of electricity running through the abandoned town of Pripyat is a reminder of the nuclear energy that gave it life -- and death. The spectres of people are frozen ghosts. The carrion birds are the only things alive. Er, so, anyway. Let's go get some virtual tea sometime and chat!